@karthikeyan's excellent answer links to The Rotation and Interior Structure Experiment on the InSight Mission to Mars (Folkner, W.M., Dehant, V., Le Maistre, S. et al. Space Sci Rev (2018) 214: 100. https://doi.org/10.1007/s11214-018-0530-5), and includes this image from there. 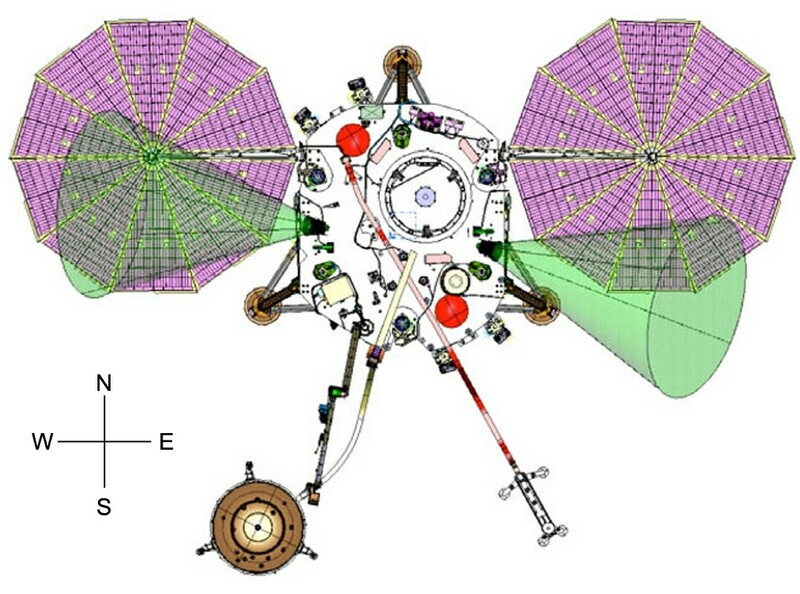 The antennas need to point towards Earth when InSight is near the edge of Mars' disk as seen from Earth so that the Doppler shift of the returned signal will be sensitive to small changes in Mars' rotation. The antennas are back-to-back so that the signals will be received and rebroadcast coherently both when moving towards Earth and away from Earth, corresponding to the East-pointing and West-pointing antenna, respectively. This will need to be done over a period of at least two years in order to get a sufficient amount of data to detect the very tiny changes in Mars' rotation due to things like the polar caps evaporating and re-forming for example. Considering all of this, I can't understand why it looks like the two horn antennas have been rotated slightly clockwise as viewed from above, slightly south of east, and north of west. Why exactly? Browse other questions tagged mars planetary-science insight delay-doppler or ask your own question.